A burglar has been sent to prison after breaking into a house on Valentine’s Day. Police said Mark Hayter, 42, from Sidley Green, Bexhill, was sentenced at Lewes Crown Court to two-and-a-half years’ imprisonment. 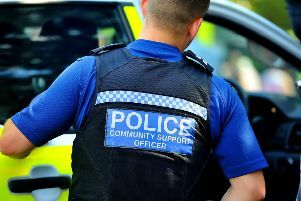 Hayter, unemployed, had broken into a house in Mitten Road, Bexhill, on the night of February 14 last year while the occupants were asleep in bed. Police said he stole a laptop computer, a purse containing bank cards, a mobile phone and a wall mirror. Hayter also entered a summer house in the garden and stole a juke-box and bottles of spirits. Police said the next day the victim received bank alerts to say the stolen cards had been used for transactions at several small shops, Subway and Sainsbury’s in Bexhill. Detectives examining closed circuit television (CCTV) images were able to identify Hayter and he was arrested at an address in Amherst Road, Bexhill, a short distance from the burgled premises. Here, police were able to recover the stolen mirror and juke-box. Police added a discarded hat found in the garden at Mitten Road was forensically examined and found to have Hayter’s DNA on it. Hayter claimed he had no idea how the stolen bank cards came to be in his possession - he thought he was using his own - and denied all knowledge of the stolen items found at Amherst Road, Sussex Police said. Following a two-day trial a jury found Hayter guilty and on July 4 he was jailed for 30 months.